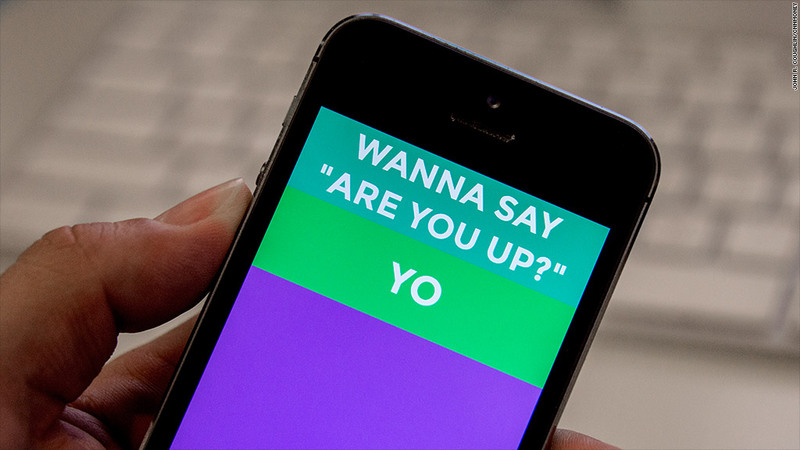 The new 'Yo' app revolutionizes communication as we know it with one simple word. Can you really call it a messaging app when there's no actual message-writing taking place? A new mobile app called Yo lets users interact with friends and contacts in zero characters -- yes zero. And you thought 140 characters was tough! In place of an actual message, users send and receive push notifications with one simple, single, predetermined greeting: "Yo." Here's how it works according to the app's how-to lesson; "Wanna say 'Good morning' to friends? JUST YO THEM. Wanna say 'Thinking 'bout you' to your love? JUST YO. Wanna say 'Are you up?' YO." Yes, "yo" (present participle "yoing") is now a verb. No, it's not a joke. Yo has garnered $1 million from investors according to its creator, Or Arbel. He just moved to San Francisco from Tel Aviv last week to pursue Yo full-time after quitting his gig as the co-founder and chief technology officer of a social investment startup. "The 'yo' means everything," says Arbel. That's a profound statement coming from the guy who first called the idea for the app "stupid." The former iOS engineer at Mobli was asked by the company's CEO, Moshe Hogeg, to quickly cook him up an app he could use to ping his personal assistant in lieu of cumbersome texts and phone calls. After dismissing the idea and getting on with his busy schedule, Arbel eventually realized the genius. After an eight-hour coding session, Yo was born. There is no email registration, no connecting with Facebook (FB) or Twitter (TWTR). You actually don't even have to open the app itself to reap its benefits. The "yo" can mean anything to anyone. It's totally up to you. It can mean you've arrived to meet your friend at the movies. Your kid is ready to be picked up from school. It's the new passing notes in class. The new smartphone side-eye without the side-eye emoji. Related: Mobile apps overtake PC Internet usage in U.S.
Arbel sees real potential for the app to change communications beyond the social sphere, as well. Imagine ordering a tall double caramel macchiato at Starbucks (SBUX) and simply waiting for a "Yo" to come through your phone when it's ready, instead of straining to listen for a barista to shout your name. Or receiving a "Yo" from your airline at the airport when it's time to board your flight. In a recent real-life iteration, the user WORLDCUP is now sending out "Yo"s every time a team scores a goal in a championship football match. The app is currently available for download from the Apple (AAPL) app store and Google (GOOG) Play.